Schoolies week is held at the end of November. It usually spreads over multiple weeks due to some states and schools finishing their school semester at different times. Queensland school leavers celebrate schoolies first, with NSW and Victoria then being spread over the following 2 weeks. Schoolies flock to a variety of locations throughout Australia and overseas. The overwhelming majority of schoolies choosing to stay on the Gold Coast, Qld. Other popular destinations include Sunshine Coast, Byron Bay, Lorne and Bali. Schoolies runs over a 3 week period in 2019 – from 16th November til 8th December. Generally the first week is Queensland school leavers and the 2nd/3rd weeks are New South Wales and Victorian schoolies. Queensland’s official Schoolies celebrations are based on the Gold Coast. 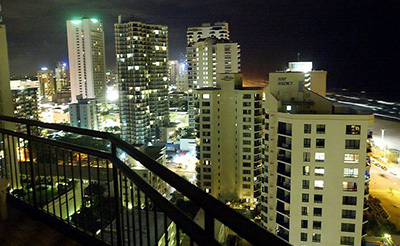 Most Schoolies stay in units in Surfers Paradise. There are also many Schoolies that choose to stay in Broadbeach which is only 10 mins from Surfers (or miss out on booking Surfers Paradise accomodation). It is sometimes alot cheaper for Schoolies to stay in other suburbs such as Southport, Mermaid Beach, Miami or Burleigh. The Light Rail travels from Southport through Surfers Paradise and down to Broadbeach. The bus network also provides easy transport for partygoers in other suburbs. Some unit blocks will not allow Schoolies to stay or have strict regulations. Accomodation providers are not allowed to have special rules for Schoolies only and instead must implement the same rules that would apply to any other customer. All major hi-rises have additional security, restrictions on amount of people allowed in units to try to keep festivities under control. Management will kick Schoolies out if they attempt to break any of their rules and room bond will be kept if any damage to the unit occurs. Some Schoolies choose to go to other destinations such as Airlie Beach and Yeppoon. Schoolies Week is full of organised activities. There are fenced off Schoolies Only access areas on the beach where most of the activities take place during day and night. Relax on the beach – The Gold Coast has some of the world’s best beaches…and is a great recovery option after a big night out. 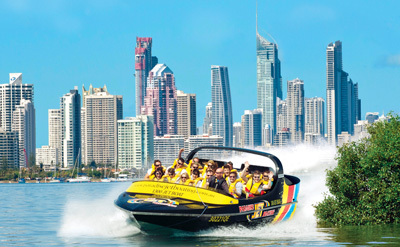 Jet Boating – Paradise Jet Boating for extreme thrills. Schoolies can book out an entire Jet Boat for their group. Nightclubs – For those that are over 18 there are heaps of clubs on the Gold Coast as well as organised Pub Crawls and Tours.